At least that’s what the audience thinks, until they get a rip-roaring rundown of Shakespeare’s classics. With zombies, talking cows and an appearance by Jerry Springer, “I Hate Shakespeare!” is a hilarious and fast-paced introduction to Shakespeare – with a modern twist. Plus, someone gets a pie in the face! 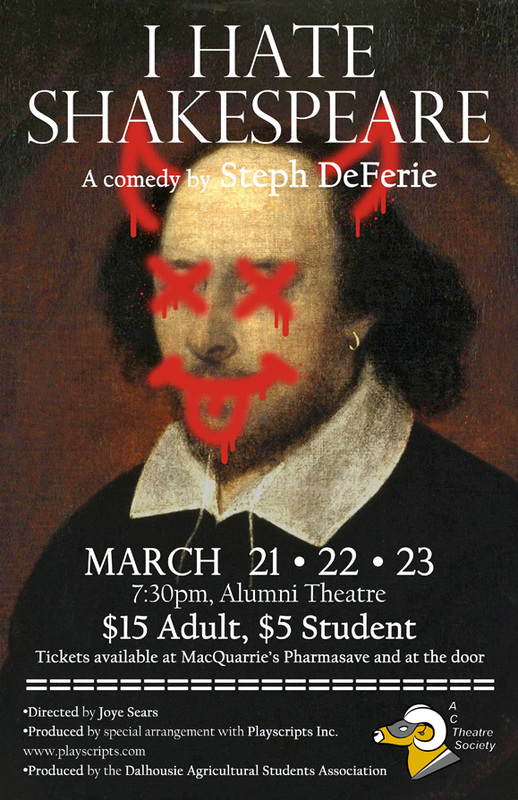 Come check out the Dal AC Theatre Society as we present “I Hate Shakespeare” by Steph DeFerie from March 21-23 in the Alumni Theatre. We have a great combination of new and returning talent on stage and behind the scenes this year and you may even see a couple of familiar Faculty faces! Tickets are just $5 for students ($15 for everyone else) and they are available at the door. If you enjoyed our Faculty play in January, you will love this crazy adventure!